Join us for the opening reception, Friday, April 12th, from 6-9pm. Visit with our artists and enjoy refreshments with live music by guitarist, Dargan Frierson. The exhibit continues through May 5, 2019. Brooks Koff “paints with glass” creating unique stained-glass mosaics that beg for a sunny window to catch and transform light into brilliant color! Unlike traditional stained-glass work, her pieces are created without the use of patterns, giving her freedom to fully explore color and design.“Connections: New Art by Brooks Koff, Michael Van Hout, and Virginia Wright-Frierson” features three artists from Art in Bloom Gallery’s stable of artists. 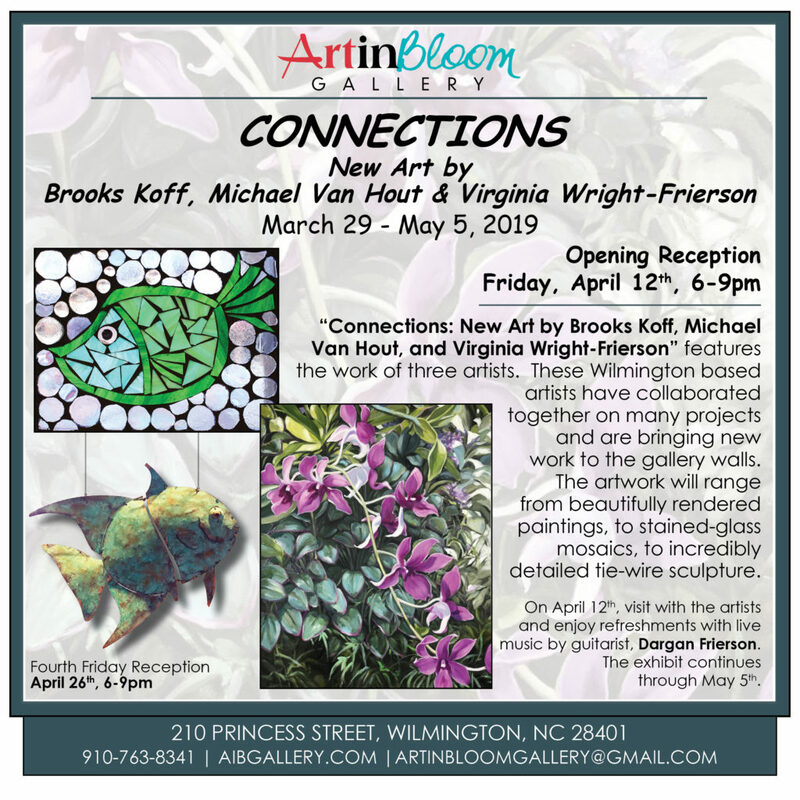 These Wilmington based artists have collaborated together on many projects and are bringing new work to the gallery walls. The artwork will range from beautifully rendered paintings, to stained-glass mosaics, to incredibly detailed tie-wire sculpture. Michael Van Hout started creating professional art over thirty-years ago after studying Forestry at NC State University and graduating with a BSA degree in sculpture from the University of North Carolina at Greensboro in 1980. In addition to wire and metal sculpture, Michael creates wood sculpture, woodcut prints, mixed media, mobiles, paintings, and commissioned works. Virginia Wright-Frierson earned her BFA degree in painting from the University of North Carolina, Greensboro, and furthered her studies in Cortona, Italy, New York and Arizona. She and her husband, Dargan, settled in Wilmington, NC in 1977. This entry was posted on Friday, April 12th, 2019 at 6:00 pm	and is filed under Special Event. You can follow any responses to this entry through the RSS 2.0 feed. Both comments and pings are currently closed.